If Black doesn't take , White will be able to make two eyes. makes seki. If Black plays inside, White gets a bent four and lives. If White plays inside, he only gets three in a row, and dies. The circled point is the only possible weakness, but Black cannot get it before White connects it. White has two eyes whatever happens. does not work, because reduces White to one eye. It seems to me that, yup, whatever you do, even giving White five moves in a row, if White doesn't put one of the stones on that circled point and Black takes it, White dies. So, that has to be the first move. I think Black can only make it seki. Black can't kill White with other plays and will make it seki after . If is played elsewhere, Black can play and White is dead. White can answer at the but Black can eventually fill in ALL the outside liberies, leaving just the the circled point as Black's last move to kill White. 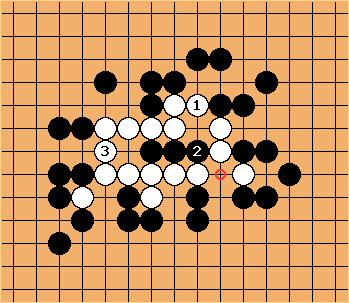 If White plays at the marked point, she dies. After there is no need to continue. So in Seki 1 makes the white group alive (without territory) and Black's three stones are alive as well. zinger: White cannot escape this way. Black can answer with a, giving white a dead shape. White still can't get out - b and c are miai - so white dies. zinger: Here is a diagram to clarify. Hopefully this will show that white can't get out. If white tries at , then black plays at , and white is still stuck. Also, when problems are presented, the standard assumption is that the stones shown are the only ones on the board. Therefore, outside cutting points such as a do not matter. It is true that this assumption is not true in a game; but it is the convention we use for solving problems as local situations.